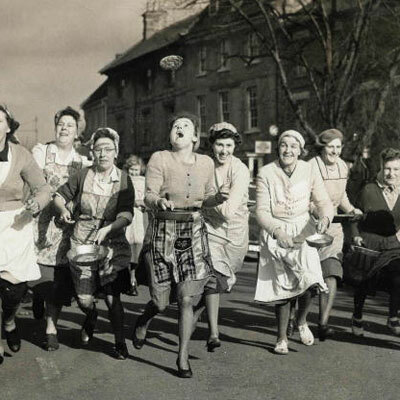 No one is quite certain how the world famous Pancake Race at Olney originated. One story tells of a harassed housewife, hearing the shriving bell, dashing to the Church still clutching her frying pan containing a pancake. Another tells that the gift of pancakes may have been a bribe to the Ringer, or Sexton that he might ring the bell sooner; for ringing the bell signalled the beginning of the day’s holiday and enjoyment, no less than to summon the people to the service at which they would be shriven of their sins before the long Lenten feast. Tradition declares that the race was first run in the year 1445, pancakes at the time being a popular dish, receiving royal favour. It was run on Shrove Tuesday, the day before Lent, and the whole day was given over to a festival of celebration, pranks and pastimes. It is not known where the original start line was but the finish line was at the Church door. The race continued through the centuries, and whilst many other local customs died, and the race itself may have lapsed many times, such lapses never caused the race to be entirely forgotten by the womenfolk of Olney. It is known to have taken place during the troublesome times of The War of the Roses (1445 to 1487). After a lapse during the Second World War, it was revived again in 1948 by the Vicar of Olney the Reverend Canon Ronald Collins. In clearing out a cupboard he came across some old photographs, which had obviously been taken in the Nineteen Twenties and Thirties of women running with frying pans. Filled with enthusiasm to revive the ancient custom, he called for volunteers, and in response thirteen runners appeared on Shrove Tuesday that year. The race immediately caught the popular imagination and people of Olney set out to enjoy this simple and colourful link with their rich past, a day of festivities. In 1950 the race became an International event. A challenge was received from the town of Liberal in Kansas, USA, where they had, after seeing the press photographs of the race at Olney, conceived the idea of setting up a similar custom. Olney readily accepted the challenge and, in a spirit of international goodwill and friendship, the two towns now compete annually and prizes are exchanged. The race is run on a timed basis.